The threat of climate change is emerging as the premier global issue of our time. As a recent report by the Intergovernmental Panel on Climate Change (IPCC) grimly warns, even a 1.5 degree C (2.7 degree F) rise in global temperatures would have “substantial” consequences, in terms of extreme weather, damage to ecosystems and calamitous impact on human communities. 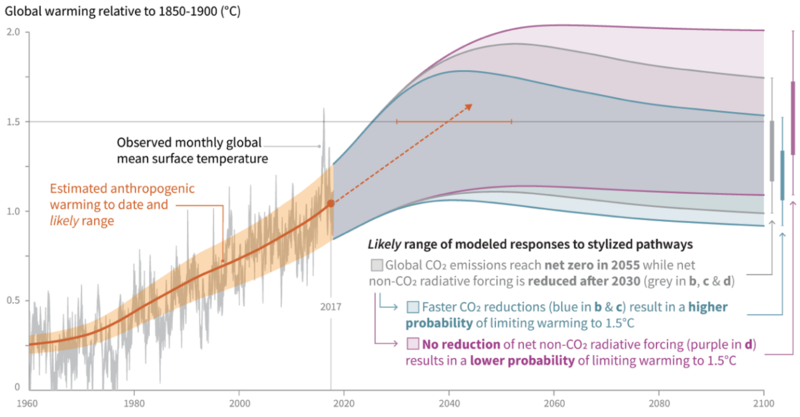 But limiting the increase to 1.5 degree C will still require a wrenching change away from fossil fuels and an equally wrenching realignment of global economies, all over the next decade or as soon as humanly possible. The longer-term economic costs of not making these wrenching changes are almost certain to dwarf the near-term costs of taking decisive action. It has now been 30 years since University of Utah researchers Martin Fleischmann and Stanley Pons announced that they had achieved desktop “cold fusion,” in a hastily called and clearly premature news conference on March 23, 1989. After several other laboratories failed to reproduce these findings, the scientific community quickly concluded that the Utah researchers were mistaken, to put it mildly. At an American Physical Society meeting a few weeks after the announcement, Steven Koonin of Cal Tech called the Utah claims the result of the incompetence and delusion of Pons and Fleischmann, to which the audience applauded in approval. John Huizenga, who later chronicled the episode in a book, called it the scientific fiasco of the century. But a funny thing happened on the way to the public dunking of Fleischmann and Pons: A number of other researchers found excess heat and other signatures of interesting physics, and these researchers, tilting against the scientific establishment, have continued to explore the phenomenon to the present day. If anything, this community has significantly grown in the past few years — several hundred researchers worldwide are now involved. So what in the world is going on here? Is this science or pseudoscience? One can certainly excuse the physics community for reticence in taking these claims seriously. After all, nuclear fusion, such as occurs in the center of stars and is the source of the light they produce, requires enormous temperatures (millions of degrees) for atoms of hydrogen, say, to acquire sufficient energy to overcome the Coulomb repulsion between protons and undergo fusion. In response, the low-energy nuclear reaction (LENR) community, as they prefer to be named, propose that the reaction is not “fusion” in the classical sense, but some related nuclear phenomenon that occurs in a condensed matter regime at modest temperatures; hence the name LENR, or, alternatively, “lattice-assisted nuclear reaction” (LANR) or “condensed matter nuclear reaction” (CMNR). The phenomenon they claim to observe produces measurable heat, but does not produce measurable amounts of ionizing radiation of the sort that causes cancer and other health problems in living organisms. In some experiments, commercially significant heat is output, and there is even hope of direct production of electricity. Systems can be scaled up from very small units to very large systems. There is no greenhouse gas emission or pollution of any kind. The “fuel” for these reactions is cheap and effectively unlimited in supply — a few grams of inexpensive materials such as hydrogen, lithium and nickel should be sufficient to provide steady output energy for a year or more (palladium, an expensive metal, is used in some of these experiments, but only as a catalyst). In most experimental setups, there is no measurable ionizing radiation above normal background levels. There is no radioactive fuel or radioactive byproducts. Unlike solar and wind power, LENR is not dependent on the vagaries of weather and climate. So who is right: the LENR community, which claims steadily improving results, or the mainstream physics community, most of whom insist that “cold fusion” was debunked long ago? As someone who has followed these developments for several years, the present author is as perplexed as anyone. By the established standards of scientific consensus, not to mention the lack of a well-understood theoretical framework, the LENR researchers should have surrendered long ago. But how can one explain ongoing results by well-qualified experimenters, and the rapidly growing interest among researchers, investors and entrepreneurs? Is this a classic example of wishful-thinking pseudoscience run amok? Or is this the start of a new era in energy technology? Almost every paper mentions “excess heat” — measured output heat energy exceeding the total energy input. In most cases the excess energy is a few watts, but [Mizuno2017], for instance, reports roughly 300 watts, and [Parkhomov2016] reports roughly 600 watts, or a total of roughly 40 kWh over three days. Most experiments use relatively sophisticated equipment, such as mass-flow calorimetry, CR-39 energetic particle detectors and time-of-flight secondary ion mass spectrometers — see [Mosier-Boss2017], [Rajeev2017], [Roussetski2017], [Kitamura2015], [Swartz2015b], [Aizawa2014] and others. Most papers have multiple authors. [Celani2018], [Kitamura2017b] and [Celani2014] each have 15 authors; [Kitamura2018], [Iwamura2017b] and [Kitamura2017a] each have 17. This timidity and unwillingness to re-investigate the data of the [Fleishmann-Pons heat effect] and related effects by editors of mainstream journals, effectively ostracizes the [condensed matter nuclear science] community from the main body of science and may be the single most effective barricade to progress. Along this line, the present author is impressed by several instances (see [Alabin2018] for instance) of authors reporting that they were unable to reproduce a finding of a previous study. From the present author’s experience, such forthright reporting is not the mark of weakness but instead is the mark of professional, seasoned experimental science. The present author, who has openly called out inflated claims and poor reproducibility in his own research field, dearly wishes his colleagues would be more open in reporting failures and disappointments. It should be noted that the bibliography below is but a subset of the published literature in this area. For example, the paper [Mosier-Boss2019] (the first item listed below) presents a synopsis of 60 published papers in the field that appeared from 1991-2018, not just in the past five years. Many others could be listed. It should be added that while many in the LENR community remain optimistic that they have identified and real and promising phenomenon, some other researchers who have been following the field remain highly skeptical of these results. These researchers have expressed their disagreements in a number of published papers, and also in a variety of online discussion forums. A bibliography of papers that present some of these skeptical assessments, together with some responses by the LENR community, is available Here. Several investors and entrepreneurs are now sufficiently confident in LENR that they are pursuing commercial ventures. One such venture is Brillouin Energy Corp. of Berkeley, California, which was founded by physicist Robert Godes. Brillouin is developing what they term a controlled electron capture reaction (CECR) process. In their experiments, ordinary hydrogen is loaded into a nickel lattice, and then an electronic pulse is passed through the system, using a proprietary control system. They claim that their device converts H-1 (ordinary hydrogen) to H-2 (deuterium), then to H-3 (tritium) and H-4 (quatrium), which then decays to He-4 and releases energy. Additional technical details are given at the Brillouin Energy website, and in a patent application. Brillouin is preparing an international commercial roll-out. Their work is backed by significant published experimental work — see, for example, [Roussetski2017], [McKubre2016], [Mosier-Boss2015], [Godes2014] and [McKubre2014] in the bibliography below. [McKubre2016], for instance, cites results for hundreds of experiments on Brillouin-like power cells, all performed independently at SRI International by highly qualified researchers. Another, more controversial, commercial venture has been founded by Andrea Rossi, a colorful (and controversial) Italian-American engineer-entrepreneur. Rossi claims that he has developed and patented a reactor (named the “E-Cat SK”), roughly the size of a suitcase, that produces up to 22 KWatt output power in the form of heat; thus 50 such units, which would fit very comfortably in a shipping container, could produce more than 1 MWatt heat. His company (Leonardo Corporation) is now inviting orders for a heat service based on the E-Cat SK — a customer pays a discounted rate for the net heat (output heat minus input electricity) produced by a E-Cat SK system sited on the customer’s premises but managed by Leonardo. See Leonardo Corporation in the U.S. or Hydro Fusion in the U.K.
On the downside, Rossi’s work leaves much to be desired from a scientific point view. Rossi remains very tight-lipped, preferring to protect his company’s intellectual property through silence, and thus has not released any details on exactly how his systems are constructed and operated. For the most part, we have only Rossi’s word about his system’s performance and commercial prospects, and thus many remain highly skeptical of his operation. There is some experimental backing for Rossi’s approach, although not nearly as much as for Brillouin. In October 2014, a team of Italian and Swedish researchers released a paper (see [Levi2014] below) that reported a “coefficient of performance” (ratio of output heat to input power) of up to 3.6, based on experiments with a Rossi-type reactor performed at a laboratory in Lugano, Switzerland. More recently, Russian physicist Alexandre Parkhomov and others have reported success in performing Rossi-like experiments — see the papers [Alabin2018], [Zelensky2017], [Parkhomov2016] and [Valay2016] below for further details. As the present author and a colleague observed in an earlier blog, the current LENR research work leaves us with three stark choices: (a) well over 100 qualified researchers from around the world, representing universities, government laboratories and private firms, each have made some fundamental errors in their experimental work, perhaps out of wishful thinking; (b) at least some of these researchers are colluding to cover less-than-forthright scientific claims; or (c) these researchers are making important discoveries that are not accepted by the larger scientific community. With each passing month, and with more researchers publishing similar results, option (a), while still possible, looks less likely. With regards to (b), while a small-scale collusion is definitely possible, a collusion involving well over 100 researchers seems most unlikely. As Benjamin Franklin wrote in his Poor Richard’s Almanack, “Three may keep a secret, if two of them are dead,” or as physicist David Robert Grimes observed in a 2016 study, the chances of maintaining a conspiracy decline sharply with time and exponentially with the number of persons involved. Along this line, since private firms are nearing commercial roll-out, there would seem little point in major fraud, since, as Mats Lewan has observed, an inexpensive power meter (see this item for instance) can be used measure to input power, and a net heat service would lose money. And yet, option (c), namely that LENR researchers have found a real phenomenon that the broader scientific community rejects, seems rather unlikely also, to say the least. Among other things, what exactly is the theoretical framework behind LENR? Although numerous LENR researchers have published papers exploring the question, as yet there is no clear consensus, and in the absence of a well-grounded physical theory, considerable caution is certainly justified. In a recent article, Huw Price points out that the more society needs something, the more prudent it is to make sure we don’t miss it. Wrongly dismissing a potential new source of carbon-free energy could be catastrophic, so LENR merits serious attention, even if it seems quite unlikely. The present author agrees that although skepticism is still in order, LENR research deserves more than the contemptuous brush-off it typically receives today, such as in this 2016 New Scientist editorial. An environmental windfall: A non-carbon, non-polluting energy source whose “fuel” costs virtually nothing and is unlimited in supply, which can be scaled from very small units to very large systems, which does not produce radioactive byproducts or harmful ionizing radiation, and which, unlike solar or wind power, is not dependent on vagaries of weather or climate. Financial repercussions. According to a 2015 Bloomberg report, at least one-half trillion dollars of bonds are at risk if oil prices drop further. International repercussions: According to a separate Bloomberg report, Saudia Arabia is having difficulty keeping its economy operating at full steam with the current drop in oil prices and its own longer term goals. Venezuela is already in a humanitarian crisis brought on in part by the recent drop in oil prices (but due also, of course, to corrupt and incompetent government). Scientific repercussions: If LENR is confirmed, the broader scientific community would be embarrassed, to put it mildly, since it has overlooked and discouraged research in the area for three decades, very likely delaying the commercial roll-out of such technology. Political repercussions: Some right-leaning political groups may oppose LENR, in spite of its potential economic benefit, since it may threaten existing fossil fuel industries. Some left-leaning political groups may oppose LENR, in spite of its potential environmental benefit, because nuclear energy has traditionally been anathema. These are listed by year, most recent (2019) first; within a year, listed alphabetically by first author. Note that in some instances, the PDF file linked to below is the entire volume of the journal in question, so that one must search in the file for the indicated page numbers of the particular article. In this listing, “low-energy nuclear reaction” (LENR), “lattice-assisted nuclear reaction” (LANR) and “condensed matter nuclear reaction” (CMNR) should be considered as largely synonymous, since these effects are most likely connected. A bibliography of papers that present some more skeptical assessments, together with some responses by the LENR community, is available Here. [Mosier-Boss2019] P. A. Mosier-Boss and L. P. Forsley, “A synopsis of nuclear reactions in condensed matter,” Global Energy Corp. Technical Report, 2019, PDF. Synopsis: Presents a synopsis of 60 condensed matter nuclear reaction papers that have appeared from 1991-2018, including tabulations of journals, authors, affiliations and nationalities. [Alabin2018] K. A. Alabin, S. N. Andreev, A. G. Sobolev, S. N. Zabavin, A. G. Parkhomov and T. R. Timerbulatov, “Isotopic and elemental composition of substance in nickel-hydrogen heat generators,” Journal of Condensed Matter Nuclear Science, vol. 26 (2018), pg. 32-44, PDF. Synopsis: Results are presented for Rossi-type Ni-Li-H experiments, which produced up to 790 MJ excess energy. No change was seen in the isotopic composition of Ni or Li, but a significant increase was seen in several other nuclides. [Celani2018] F. Celani, B. Ortenzi, S. Pella and A. Spallone, G. Vassallo, E. Purchi, S. Fiorilla, L. Notargiacomo, C. Lorenzetti, A. Calaon, A. Spallone, M. Nakamura, A. Nuvoli, P. Cirilli and P. Boccanera, “Improved stability and performance of surface-modified constantan wires, by chemical additions and unconventional geometrical structures,” Journal of Condensed Matter Nuclear Science, vol. 27 (2018), pg. 9-21, PDF. Synopsis: The anomalous heat effect observed by others in Cu-Ni-Mn (“constantan”) materials with H2-D2 absorption is enhanced by high temperatures and the addition of Fe-K-Mn. [Kitamura2018] A. Kitamura, A. Takahashi, K. Takahashi, R. Setoa, T. Hatanoa, Y. Iwamura, T. Itoh, J. Kasagi, M. Nakamura, M. Uchimurac, H. Takahashi, S. Sumitomo, T. Hioki, T. Motohiro, Y. Furuyama, M. Kishida and H. Matsune, “Excess heat evolution from nanocomposite samples under exposure to hydrogen isotope gases,” International Journal of Hydrogen Energy, vol. 43, no. 33 (16 Aug 2018), pg. 16187-16200, PDF. Synopsis: At 200-300 C, binary metal nanocomposite samples produced excess power of 3-24 W; the excess power was observed not only in D-Pd-Ni but also in H-Pd-Ni and H-Cu-Ni systems. [Mills2018] R. Mills, Y. Lu, R. Frazer, “Power determination and hydrino product characterization of ultra-low field ignition of hydrated silver shots,” Chinese Journal of Physics, vol. 56, (2018), pg. 1667-1717, DOI: 10.1016/j.cjph.2018.04.015, preprint at PDF. Synopsis: A hydrino reactor consisting of a water-entrained injected molten silver matrix produced a plasma that delivered 400 KW power in EUV and UV light. [Tanzella2018] F. Tanzella, “Isoperibolic hydrogen hot tube reactor studies,” SRI International Technical Report, Mar 2018, PDF. Synopsis: Over 100 runs were performed on 34 different Ni-coated cores, with experiments operated in H2 or He gas from 200 C to 600 C. The measured coefficient of performance (ratio of output power to input power) ranged from 1.27 to 1.41. [Beiting2017] E. J. Beiting, “Investigation of the nickel-hydrogen anomalous heat effect,” Aerospace Technical Report, 15 May 2017, PDF. Synopsis: Experiments with Ni-Pd materials produced 7.5% more power than the input power over a period of 1000 hours (40 days). [Itoh2017] T. Itoh, Y. Iwamura, J. Kasagi and H. Shishido, “Anomalous excess heat generated by the interaction between nano-structured Pd/Ni surface and D2 gas,” Journal of Condensed Matter Nuclear Science, vol. 24 (2017), pg. 179-190, PDF. Synopsis: In experiments with nano-structured Pd and Ni, a 123 C increase in temperature was observed compared to a control experiment. [Iwamura2017a] Y. Iwamura, T. Itoh, J. Kasagi, A. Kitamura, A. Takahashi and K. Takahashi, “Replication experiments at Tohoku University on anomalous heat generation using nickel-based binary nanocomposites and hydrogen isotope gas,” Journal of Condensed Matter Nuclear Science, vol. 24 (2017), pg. 191-201, PDF. Synopsis: In one experiment with D2 gas, excess heat up to 10 W was observed. The amount of excess energy reached 2.5 MJ, corresponding to 14.9 eV per absorbed D.
[Iwamura2017b] Y. Iwamura, T. Itoh, J. Kasagi, A. Kitamura, A. Takahashi, K. Takahashi, R. Seto, T. Hatano, T. Hioki, T. Motohiro, M. Nakamura, M. Uchimura, H. Takahashi, S. Sumitomo, Y. Furuyama, M. Kishida, and H. Matsune, “Reproducibility on anomalous heat generation by metal nanocomposites and hydrogen isotope gas,” Proceedings of the 18th Meeting of Japan CF Research Society (JCF18), Tohoku University, Japan (24-25 Nov 2017), PDF. Synopsis: Researchers obtained significant anomalous heat generation in experiments with Pd-Ni-Zr and Cu-Ni-Zr samples, at elevated temperatures. [Kitamura2017a] A. Kitamura, A. Takahashi, K. Takahashi, R. Seto, T. Hatano, Y. Iwamura, T. Itoh, J. Kasagi, M. Nakamura, M. Uchimura, H. Takahashi, S. Sumitomo, T. Hioki, T. Motohiro, Y. Furuyama, M. Kishida and H. Matsune, “Comparison of excess heat evolution from zirconia-supported Pd-Ni nanocomposite samples with different Pd/Ni ratio under exposure to hydrogen isotope gases,” Proceedings of the 18th Meeting of Japan CF Research Society (JCF18), Tohoku University, Japan (24-25 Nov 2017), pg. 1-13, PDF. Synopsis: Anomalous heat effect was seen in the interaction of hydrogen isotope gas and nanoparticles; excess power of 3 to 24 watts continued for several weeks. [Kitamura2017b] A. Kitamura, A. Takahashi, K. Takahashi, R. Seto, Y. Matsuda, Y. Iwamura, T. Itoh, J. Kasagi, M. Nakamura, M. Uchimura, H. Takahashi, T. Hioki and T. Motohiro, Y. Furuyama and M. Kishida, “Collaborative examination on anomalous heat effect using nickel-based binary nanocomposites supported by zirconia,” Journal of Condensed Matter Nuclear Science, vol. 24 (2017), pg. 202-213, PDF. Synopsis: At temperatures 200-300 C, samples of Pd-Ni-Zr and Cu-Ni-Zr showed excess energy of 5-10 W for periods of several days. [Mizuno2017] T. Mizuno, “Observation of excess heat by activated metal and deuterium gas,” Journal of Condensed Matter Nuclear Science, vol. 25 (2017), pg. 1-25, PDF. Synopsis: In a series of Ni-D2 experiments, with reactor temperature up to 300 C, running up to 30 days, typically 300 W excess heat was produced. PDF. Synopsis: During Pd/D deposition, high-energy particles, 133 times background, were detected corresponding to tracks created in the Pd deposit. [Rajeev2017] K. P. Rajeev and D. Gaur, “Evidence for nuclear transmutations in Ni-H electrolysis,” Journal of Condensed Matter Nuclear Science, vol. 24 (2017), pg. 278-283, PDF. Synopsis: Using a time-of-flight secondary ion mass spectrometer (ToF-SIMS), a Ni-H system produced isotopes 58-Ni, 60-Ni and 62-Ni, with ratios differing significantly from natural abundances. PDF. Synopsis: Researchers performed Pd electrodeposition in D2O and H2O electrolytes in the presence of a magnetic field, and found a statistically significant increase in the number of tracks measured in the D2O runs. [Zelensky2017] V. F. Zelensky, V. O. Gamov, A. L. Ulybkin and V. D. Virich, “Experimental device of cold HD-fusion energy development and testing (verification experiment),” Journal of Condensed Matter Nuclear Science, vol. 24 (2017), pg. 168-178, PDF. Synopsis: Results generally confirmed earlier results obtained by an independent group in Lugano, Switzerland, for the HTE-Cat reactor. See [Levi2014] below. [Kitamura2016] A. Kitamura, E. F. Marano, A. Takahashi, R. Seto, T. Yokose, A. Taniike and Y. Furuyama, “Heat evolution from zirconia-supported Ni-based nano-composite samples under exposure to hydrogen isotope gas,” Proceedings of the 16th Meeting of Japan CF Research Society (JCF16), (2016) pg. 1-16, PDF. Synopsis: Excess power of 11-12 W was recorded repeatedly in both Pd-Ni-ZrO2 and Cu-Ni-ZrO2 sample runs with both H2 and D2 gas. [McKubre2016] M. C. H. McKubre, “Cold Fusion-CMNS-LENR: Past, present and projected future status,” Journal of Condensed Matter Nuclear Science, vol. 19 (2016), pg. 183-191, PDF. Synopsis: Provides an overview and status of the field as of early 2016, including a brief summary of hundreds of experiments performed at SRI International. [Mosier-Boss2016] P. A. Mosier-Boss, L. P. G. Forsley, and P. K. McDaniel, “Investigation of nano-nuclear reactions in condensed matter: Final report,” Defense Threat Reduction Agency Report (2016), PDF. Synopsis: This summarizes over 20 years of experimental work and analysis in LENR at the U.S. Navy’s Space and Naval Warfare Systems Center Pacific and some related centers. [Parkhomov2016] A. G. Parkhomov and E. O. Belousova, “Research into heat generators similar to high-temperature Rossi reactor,” Journal of Condensed Matter Nuclear Science, vol. 19 (2016), pg. 244-256, PDF. Synopsis: Devices similar to those of Rossi, using a mixture of Ni and Li-AlH4, produced more than 40 KwH or 150 MJ heat in excess energy when the system was heated to 1100 C or higher. [Violante2016] V. Violante, E. Castagna, S. Lecci, G. Pagano, M. Sansovini and F. Sarto, “Heat production and RF detection during cathodic polarization of palladium in 0.1 M LiOD,” Journal of Condensed Matter Nuclear Science, vol. 19 (2016), pg. 319-324, PDF. Synopsis: Radio-frequency emissions were observed in several experiments with Pd-based cathodes. [Valay2016] M. Valat, A. Goldwater, R. Greenyer, R. Higgins and R. Hunt, “Investigations of the Lugano HotCat reactor,” Journal of Condensed Matter Nuclear Science, vol. 21 (2016), pg. 81-96, PDF. Synopsis: In an attempt to replicate the Lugano report of Rossi’s HotCat reactor, using a Ni-Li-H compound, a team found that the earlier report had overestimated the results, but still found a significant amount of excess thermal energy and low energy gamma radiation. [Kitamura2015] A. Kitamura, A. Takahashi, R. Seto, Y. Fujita, A. Taniike and Y. Furuyama, “Brief summary of latest experimental results with a mass-flow calorimetry system for anomalous heat effect of nano-composite metals under D(H)-gas charging,” Current Science, vol. 108, no. 4 (Feb 2015), pg. 589-593, PDF. Synopsis: An experimental run with a Cu-Ni-ZrO2 sample produced 15 watts for three days, and 10 watts for three weeks. [Letts2015] D. Letts, “Highly reproducible LENR experiments using dual laser stimulation,” Current Science, vol. 108 (2015), pg. 559-561, PDF. Synopsis: Excess power was observed in 161 out of 170 Pd-D tests stimulated by dual lasers at 8, 15 and 20 THz. [Mills2015] R. Mills and J. Lotoski, “H2O-based solid fuel power source based on the catalysis of H by HOH catalyst,” International Journal of Hydrogen Energy, vol. 40 (2015), pg. 25-37, PDF. Synopsis: When high current was applied, a water-based solid fuel element exploded with a large burst of ultraviolet light. [Mosier-Boss2015] P. A. Mosier-Boss, L. P. Forsley, F. E. Gordon, D. Letts, D. Cravens, M. H. Miles, M. Swartz, J. Dash, F. Tanzella, P. Hagelstein, M. McKubre and J. Bao, “Condensed matter nuclear reaction products observed in Pd/D co-deposition experiments,” Current Science, vol. 108 (2015), pg. 656-659, PDF. Synopsis: A Pd/D co-deposition experiment produced heat, transmutation, tritium, neutrons and energetic charged particles. [Swartz2015a] M. Swartz, G. Verner, J. Tolleson, L. Wright, R. Goldbaum, P. Hagelstein, “Amplification and restoration of energy gain using fractionated magnetic fields on ZrO2-PdD nanostructured components,” Journal of Condensed Matter Nuclear Science, vol. 15 (2015), pg. 66-80, PDF. Synopsis: Experiments with nanocomposite ZrO2-PdNiD materials exhibited significant energy gain over long periods of time, with fractionated magnetic fields having a significant amplification effect. [Swartz2015b] M. R. Swartz, G. Verner, J. Tolleson, L. Wright, R. Goldbaum, P. Mosier-Boss and P. L. Hagelstein, “Imaging of an active NANOR-type LANR component using CR-39,” Journal of Condensed Matter Nuclear Science, vol. 15 (2015), pg. 81-91, PDF. Synopsis: Experiments with CR-39 energized particle detectors found tracks corresponding to components exhibiting energy production, strongly suggesting that the operation is a nuclear process. [Aizawa2014] H. Aizawa, K. Mita, D. Mizukami, H. Uno and H. Yamada, “Detecting energetic charged particle in D2O and H2O electrolysis using a simple arrangement of cathode and CR-39,” Journal of Condensed Matter Nuclear Science, vol. 13 (2014), pg. 6-12, PDF. Synopsis: A CR-39 energetic particle detector with Ni film found tracks in one out of seven experimental runs with D2O and two out of five runs with H2O. [Celani2014] F. Celani, E. F. Marano, B. Ortenzi, S. Pella, S. Bartalucci, F. Micciulla, S. Bellucci, A. Spallone, A. Nuvoli, E. Purchi, M. Nakamura, E. Righi, G. Trenta, G. L. Zangari, A. Ovidi, “Cu-Ni-Mn alloy wires, with improved sub-micrometric surfaces, used as LENR device by new transparent, dissipation-type calorimeter,” Journal of Condensed Matter Nuclear Science, vol. 13 (2014), pg. 56-67, PDF. Synopsis: An experimental run with Ni-Cr wire achieved 21 W excess power. [Godes2014] R. Godes, R. George, F. Tanzella and M. McKubre, “Controlled electron capture and the path toward commercialization,” Journal of Condensed Matter Nuclear Science, vol. 13 (2014), pg. 127-137, PDF. Synopsis: In over 150 experimental runs, using two different cell/calorimeter designs, excess energies of up to 100% (i.e., heat output twice the input energy) have been observed in runs with Q pulses tuned to the resonance of Pd and Ni hydrides in pressurized vessels. [Jiang2014] S. Jiang, X. Xu, L. Zhu, S. Gu, X. Ruan, M. He and B. Qi, “Neutron burst emissions from uranium deuteride and deuterium-loaded titanium,” Journal of Condensed Matter Nuclear Science, vol. 13 (2014), pg. 253-263, PDF. Synopsis: Bursts of up to 2800 neutrons occurred in less than 30 seconds in an experiment with deuterium-loaded titanium and uranium deuteride samples at room temperatures, suggesting nuclear reactions. [Levi2014] G. Levi, E. Foschi, B. Hoistad, R. Pettersson, L. Tegner and H. Essen, “Observation of abundant heat production from a reactor device and of isotopic changes in the fuel,” University of Bologna, 2014, PDF. Synopsis: Researchers running a version of Rossi’s E-Cat found a coefficient of performance of 3.2 (for the 1260 C run) and 3.6 (for the 1400 C run). The total net energy output was about 1.5 MWh. Changes were also observed in the isotopic composition of lithium and nickel. Note: Strictly speaking this is not a peer-reviewed publication (and some weaknesses have subsequently been identified in the analysis), but it is included here because several others reference it. [McKubre2014] M. McKubre, J. Bao and F. Tanzella, “Calorimetric studies of the destructive stimulation of palladium and nickel fine wires,” Journal of Condensed Matter Nuclear Science, vol. 13 (2014), pg. 337-345, PDF. Synopsis: Thirty experiments, some with Pd and others with Ni, demonstrated excess energy, with the active region primarily in the co-deposited material. [Miles2014] M. H. Miles, “Co-deposition of palladium and other transition metals in H2O and D2O solutions,” Journal of Condensed Matter Nuclear Science, vol. 13 (2014), pg. 401-410, PDF. Synopsis: Experiments studying co-deposition of Pd, Ru, Re, Ni and Ir in H2O and D2O ammonium systems found significant excess in the Pd-D2O system but none with Ru, Re or Ni systems. [Mosier-Boss2014] P. A. Mosier-Boss, “It is not low energy — but it is nuclear,” Journal of Condensed Matter Nuclear Science, vol. 13 (2014), pg. 432-442, PDF. Synopsis: Pd/D co-deposition experiments produced energetic particles: 2.45 MeV neutrons, 3-10 MeV protons, 2-15 MeV alphas and 14.1 MeV neutrons. [Sakoh2014] H. Sakoh, Y. Miyoshi, A. Taniike, Y. Furuyama, A. Kitamura, A. Takahashi, R. Seto, Y. Fujita, T. Murota and T. Tahara, “Hydrogen isotope absorption and heat release characteristics of a Ni-based sample,” Journal of Condensed Matter Nuclear Science, vol. 13 (2014), pg. 471-484, PDF. Synopsis: Hydrogen isotope absorption runs using Cu-Ni-ZrO2 and Ni-ZrO2 nano-powders produced long-lasting temperature changes corresponding to high levels of energy output per atom of Ni. [Swartz2014] M. R. Swartz and P. L. Hagelstein, “Demonstration of energy gain from a preloaded ZrO2-PdD nanostructured CF/LANR quantum electronic Device at MIT,” Journal of Condensed Matter Nuclear Science, vol. 13 (2014), pg. 516-527, PDF. Synopsis: Several experiments with a ZrO2-PdD device found energy gain ranging from 5 to 16.